All transactions are safe and secure with a reliable history in online purchasing behind each of our associates. Buy the Stewie Cool Hhhwhip t-shirt to own Family Guy clothing and merchandise. Deliver all of Stewie's Family Guy quotes in one of these bestselling Stewie Cool Hwhip Family Guy t-shirts. 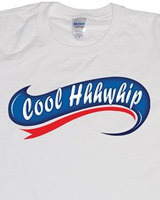 The tee celebrates the hilarious moment from the Family Guy cartoon where Brian tells Stewie that he is mispronouncing "Cool Whip" by adding an 'H' to the front of "whip". This Cool Hwhip tee is great for parties or relaxing with a refreshing glass of Pawtucket Patriot Ale from The Drunken Clam, a local Quahog tavern. Wear it under your Quagmire costume. In addition to the Stewie Cool Hhhwhip tee above, browse the Family Guy Clothing Gallery for more apparel like men's and women's clothes, kids shirts or hoodies.